In 2010, Congress passed the Affordable Care Act, a law to provide affordable healthcare for Americans. Since the passage of the ACA (aka Obamacare), the number of Americans with health insurance has increased by 20 million. Obamacare was passed over objections from conservatives who have led a number of legal challenges against it. The most hopeful early attempt to bring down the healthcare bill had only mediocre success in 2012 when the Supreme Court upheld the majority of the Act as constitutional. Challengers’ hopes have been revived in the Trump years. After a 2017 tax law altered the effect of the ACA’s Individual Mandate, a number of GOP states brought a new attempt to take down the act in its entirety. The lawmakers who structured the ACA had to find a way to get all Americans involved in the health insurance system. If people have an option about whether to buy insurance, the healthier might opt out. But the system needs the payments of the healthier people to subsidize those requiring more costly services. 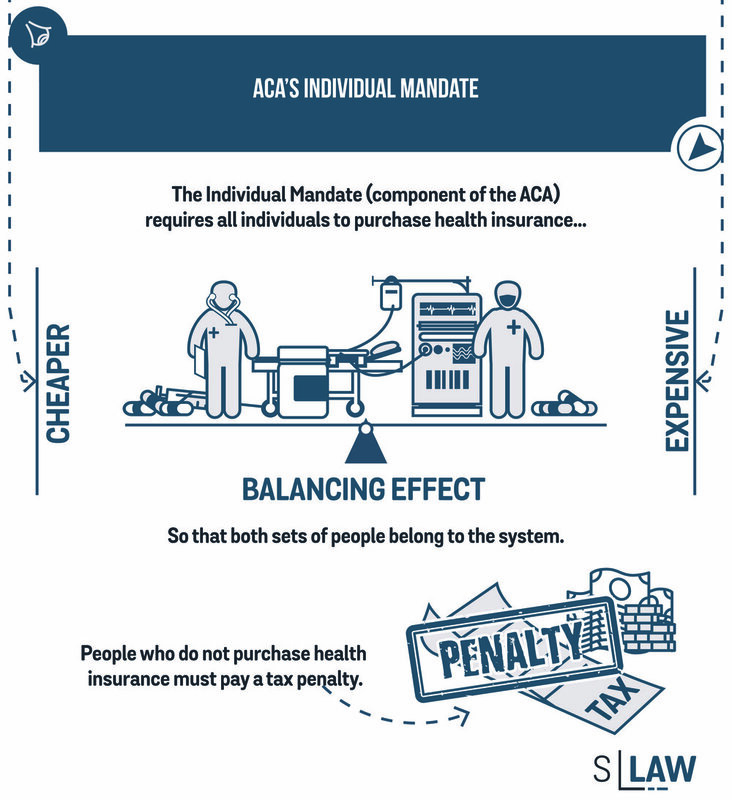 To balance out the costs, the ACA established the Individual Mandate. The Individual Mandate component of the ACA requires everyone to buy health insurance. If you don’t, you have to pay a tax penalty. So individuals could choose between paying a tax and getting no benefit, or buying insurance. That’s how the ACA would get enough healthy people into the system to subsidize those requiring more costly services. Republicans’ largest complaint against Obamacare is the Individual Mandate. The Republican party stands for small government and a large degree of individual liberty. Obamacare conflicts with these values in requiring individuals to purchase health insurance. Shortly after the ACA was passed, opponents filed a lawsuit challenging the Act’s constitutionality. The litigants complained that several provisions of the ACA were unconstitutional, including the “Medicaid expansion” and the Individual Mandate. The Individual Mandate, they argued, was an improper violation of individual liberty and the federal government does not have the constitutional authority to enact it. The case reached the Supreme Court (National Federation of Independent Business v. Sebelius). Many people expected the Court — if it chose to rule the Mandate constitutional — would rule it valid under the Interstate Commerce clause of the Constitution, which gives the federal government broad powers to regulate. But the swing vote, Justice John Roberts, decided it made more sense as a tax. The Supreme Court said the Individual Mandate is a valid exercise of the federal government’s power to tax individuals. The Mandate would stand. Fast-forward to the Trump era. The 2017 Congress with a strong Republican hold and a Republican president passed a law affecting taxes: The Tax Cuts and Jobs Act. The TCJA included a provision relating to the ACA’s tax penalty. It reduced the tax penalty to zero dollars. Now, there’s no penalty for people who don’t buy insurance. The ACA is left with only a polite request by the government that people do so. With the tax penalty of the Individual Mandate gone, the ACA opposition saw an opening to challenge the Mandate’s constitutionality. A number of Republican-controlled states, led by Texas, argued to a federal judge in Texas that the Individual Mandate cannot be valid under the federal government’s Taxing Power if there is no tax. The Texas federal court found the litigants’ arguments compelling and ruled in late 2018 that the Individual Mandate is no longer constitutional. Moreover, the rest of the ACA must fail. The Texas judge ruled that the Individual Mandate was an essential component of the entirety of the ACA. Without it, the ACA doesn’t work. In legal words, the Individual Mandate is not “severable” from the rest of the ACA. Once the Mandate goes down, the rest of the Act goes with it. Republicans rejoice in this potentially major ruling, but they have an appeals court journey ahead. Republicans sued the federal government in the Texas case, which is technically the Trump administration. But, as we know, the federal government today doesn’t like the ACA as much as the federal government that passed the Act. Knowing the Act might get a less-than-stellar defense from Trump administration staff, a group of mostly liberal states intervened as defendants in the case. It’s the liberal states that will be presenting arguments in the appeals courts against the Texas lower court ruling. In fact, the Department of Justice already told the 5th Circuit Court of Appeals it doesn’t plan to defend the ACA. The intervenor states defending the ACA have two focuses. They want the appeals court to rule that the Individual Mandate is constitutional, even though Congress has deleted the tax penalty. Or, a route which may have the same result, they want the court to rule that even if the Mandate goes down, the rest of the ACA can still stand. That’s the “severability” argument (that the Mandate is “severable” from the rest of the ACA). Regarding constitutionality of the Mandate: the Intervenors can argue that it’s possible for the federal taxing power to give the Mandate constitutional authority even if federal tax penalty payments don’t continue to come in. Thus, the constitutional theory of it doesn’t depend on the federal government exercising the tax. The American Medical Association filed an amicus brief in the Texas court explaining this argument. On severability, the headline argument was voiced, again, by the AMA brief and also by a group of law professors in an amicus brief. The argument says: If Congress chose to alter the tax effect of the ACA but chose intentionally to leave the ACA generally alone, then Congress intended for the tax penalty to be “severable” from the rest of the Act. Because a court is supposed to seek “Congressional intent” in determining severability, the ACA defenders argue, the court only needs to consider what Congress did and did not do when it made legislative changes. Obamacare does much more than just require everyone to have health insurance. The Act contains a number of healthcare protections, including several major ones that Republicans like. For example, the ACA prevents healthcare providers from discriminating against people with pre-existing medical conditions. Health providers can’t charge people more based on their pre-existing conditions. This is a popular provision which prevents insurance from being prohibitively expensive for people with serious medical conditions. Many GOP lawmakers and President Trump have pledged their support for the protection. The ACA also allows young adults to stay on their parents’ health insurance plans until the age of 26. It’s another provision the Republicans don’t want to see go. Republicans have been critical of the next two provisions in the past, but these are issues which members of the party have come around to more recently. The ACA provides subsidies on health insurance premiums to many individuals. The subsidies make the cost of insurance more reasonable and haven’t been a huge source of cost for the federal government compared to other healthcare costs. The ACA’s Medicaid Expansion provision is the piece of the ACA the Supreme Court squashed in its 2012 NFIB v. Sebelius decision. The Medicaid Expansion required states to expand Medicaid to cover more people, higher income levels than Medicaid covered before. Now, after NFIB v. Sebelius, states have the option on whether to expand Medicaid. The offer from the federal government comes with money. States that expand Medicaid get matching federal funds to help. The Medicaid Expansion faced harsh criticism from Republicans early on, but several red states have been tempted by the federal dollars, with some more considering it. Commentators are wondering whether, if the ACA goes down, the Republican party can come up with a healthcare solution retaining the more popular elements of the ACA.